MOST ROUNDNESS MEASURING MACHINES ARE SUPPLIED WITH A MASTER CALIBRATION SPHERE WHEN THEY ARE ORIGINALLY PURCHASED. AFTER SOME PERIOD OF USE, THESE HIGH QUALITY SPHERES ARE SO DEGRADED BY WEAR FROM STYLUS CONTACT AND/OR CORROSION THAT THEY ARE NO LONGER SUITABLE FOR USE. PURCHASING REPLACEMENT MASTER CALIBRATION SPHERES FROM THE ORIGINAL EQUIPMENT MANUFACTURER IS EXPENSIVE INDEED. 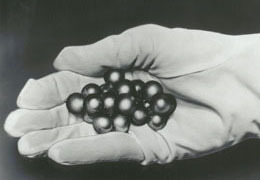 THE ORIGINAL MASTER CALIBRATION SPHERES ARE USUALLY MADE OF LOW ALLOY CHROME STEEL. THIS MATERIAL HAS A UNIFORM STRUCTURE, GOOD HARDNESS, AND GOOD LONG TERM DIMENSIONAL STABILITY. THESE CHARACTERISTICS MAKE IT RELATIVELY EASY TO PRODUCE SPHERES OF EXCELLENT QUALITY, BUT THIS MATERIAL IS NOT VERY WEAR-RESISTANT AND IT IS VERY PRONE TO RUST. 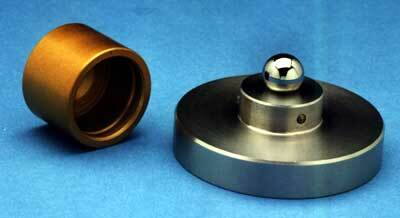 THE MASTER CALIBRATION SPHERE FOR THE AUT-MS.5 IS MANUFACTURED FROM MICRO GRAIN TUNGSTEN CARBIDE. THIS MATERIAL IS MANY TIMES MORE WEAR-RESISTANT THAN HARD CHROME ALLOY STEEL AND IT HAS EXCELLENT LONG-TERM DIMENSIONAL STABILITY. IN ADDITION, THIS MATERIAL WILL NOT RUST, IT IS HIGHLY CORROSIVE RESISTANT. THE MASTER CALIBRATION SPHERE IS 0.500 INCH (12.7MM) DIAMETER. THE TUNGSTEN CARBIDE MASTER CALIBRATION SPHERE IS PERMANENTLY ATTACHED TO A 3.00 INCH (76.2MM) DIAMETER STAINLESS STEEL FLANGE WITH A VERY HIGH SHEAR GLUE. IN ADDITION, THE JOINT IS REINFORCED WITH A STEEL PIN THAT PENETRATES DEEP INTO THE MASTER CALIBRATION SPHERE AND INTO THE FLANGE. THE LOWER SURFACE OF THE STAINLESS STEEL FLANGE IS RECESSED TO LEAVE AN ANNULAR RING AROUND THE OUTSIDE EDGE. THIS RING IS PRECISION LAPPED OPTICALLY FLAT TO PROVIDE A STABLE INTERFACE WITH THE ROUNDNESS MEASURING MACHINE TABLE. THE QUALITY OF THE MASTER CALIBRATION SPHERE IS STATE OF THE ART. IT IS SPHERICAL TO LESS THAN 2.5 MICRO-INCHES (50.8NM). NOTE: ALTHOUGH VERY ELABORATE LABORATORY TECHNIQUES CAN MEASURE ROUNDNESS TO SOMEWHAT FINER TOLERANCE, THIS IS GENERALLY ACCEPTED AS STATE OF THE ART FOR COMMERCIAL MEASUREMENT. THE MAXIMUM SURFACE ROUGHNESS OF THE MASTER CALIBRATION SPHERE IS 0.5 MICRO-INCHES (12.7NM)RA. A PROTECTIVE CAP IS PROVIDED TO PRESERVE THE ORIGINAL HIGH-QUALITY OF THE MASTER SPHERE FROM ACCIDENTAL DAMAGE. THE MASTER SPHERE IS SHIPPED IN A PERMANENT STORAGE CASE. EACH OF THE MASTER CALIBRATION SPHERES HAS A SERIAL NUMBER PERMANENTLY STAMPED INTO ITS STAINLESS STEEL FLANGE. EVERY MASTER CALIBRATION SPHERE IS SUPPLIED WITH A POLAR CHART RECORDING TO VERIFY ITS SPHERICITY. COMPARE ALL OF THE POSITIVE FEATURES AND THEN COMPARE THE PRICE. CUSTOM-MANUFACTURED ROUNDNESS CALIBRATION MASTERS WILL BE MADE IN ANY SIZE AND OF ANY MATERIAL ON SPECIAL ORDER. A MASTER CALIBRATION SPHERE IS ACTUALLY SELF-CALIBRATING. A KEY POINT IS PROVIDED ON THE TOP SURFACE OF THE MASTER SPHERE FLANGE. THIS KEY CONSISTS OF A RED DOT. TO CALIBRATE THE MASTER CALIBRATION SPHERE, YOU SIMPLY RECORD A ROUNDNESS MEASUREMENT OF THE MASTER SPHERE AND THEN RELOCATE THE MASTER SPHERE TO A POSITION AT 180 DEGREES FROM THE ORIGINAL POSITION AND RECORD THE ROUNDNESS AGAIN. THE TWO RECORDINGS ARE THEN ANALYZED. THE ERRORS THAT MOVE WITH THE MASTER CALIBRATION SPHERE ARE ERRORS IN THE SPHERE AND THE ERRORS THAT REMAIN IN THEIR ORIGINAL POSITIONS ARE ERRORS IN THE MACHINE. FOR VERY CRITICAL EVALUATION, THE MASTER CALIBRATION SPHERE MAY BE INDEXED TO MORE THAN TWO POSITIONS.